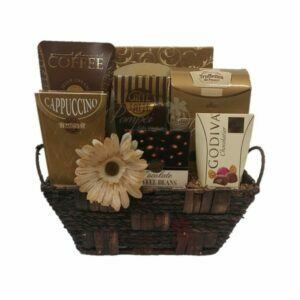 Our Simple Thank You Gourmet Gift Basket is the perfect way to show someone you are appreciative in the coolest way! 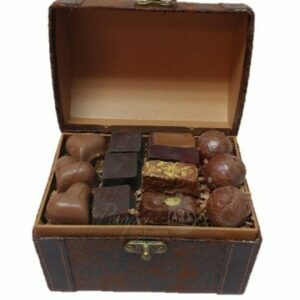 A wooden container holds crackers, popcorn, cheese spread, cookies, and chocolates – all the necessities for great snacking. 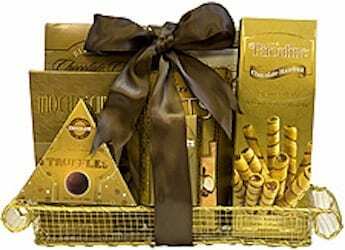 This basket is the ideal size for a single person or light sharing. As always, a personalized card will be attached to your order! 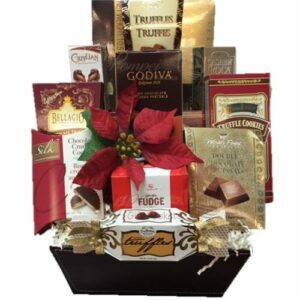 Gift Baskets have recently become a new-aged way of gift giving. 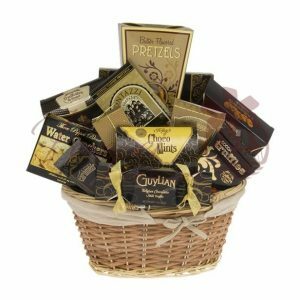 From all holidays like Valentine’s Day to Father’s Day to New Years, gourmet gift baskets add a special touch to your recipient’s holiday. 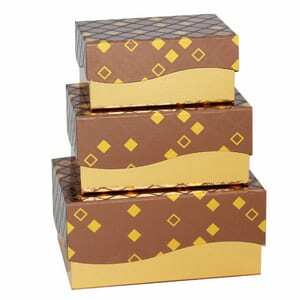 National Observances have also become famous as gift giving reasons as well. 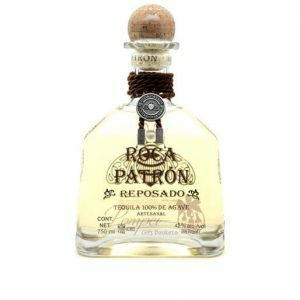 Nurse’s Appreciation Week, Teacher’s Day, Boss’ Day, and Employee Appreciation Day are all wonder reasons to put a smile on a coworker or mentor’s face. 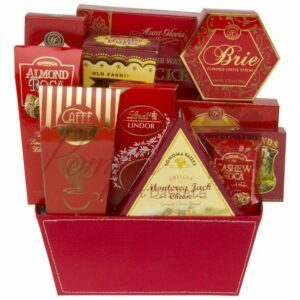 Thank you, job promotions, and graduation are very popular reasons for gifting a gourmet basket as well. 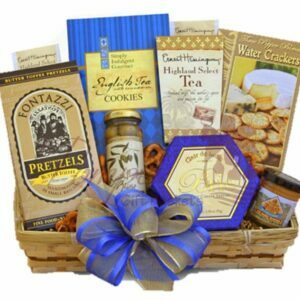 All of our gift baskets are hand-crafted and nothing comes prepackaged from a warehouse shelf. 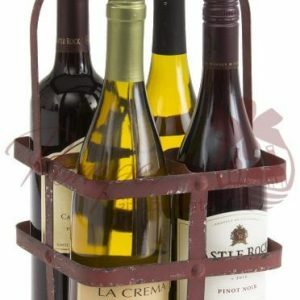 Because of this, every basket is unique and individual and can differ slightly by color of the products, positioning, or brand of product. If there are any food allergies, please let us know in the “notes” section or by using the contact form. Please inform us of your order number and food allergy so we can inform you of which products are available to you. 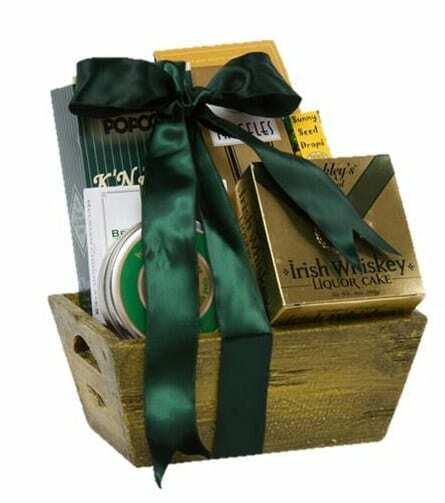 Gift Baskets make a wonderful corporate gift, house warming gift, wedding present, or even a centerpiece at a tricky tray or bridal party. 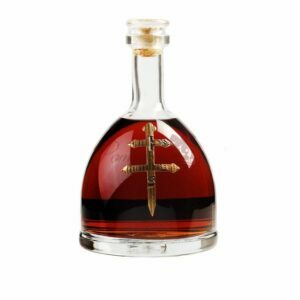 Contact us for combined shipping rates and large volume discounts. 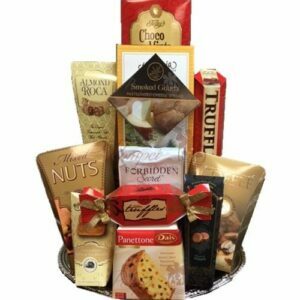 The wonderful thing about this gift basket is that it can be made to order. If someone has a food allergy, items can be substituted or replaced. Kosher? No problem! 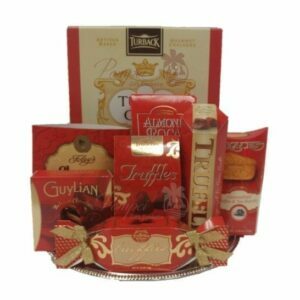 We carry a handful of kosher snacks and treats that will put a smile on your recipients face. We can do this because none of our baskets linger in a warehouse or shelf. 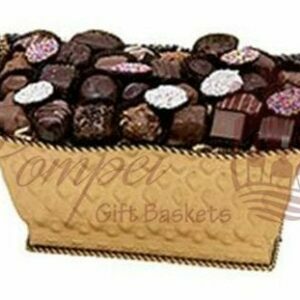 Our baskets are handmade and we highly encourage custom gift baskets for all occasions. We even accept gluten free orders, although pricing may vary. If this is the case, we suggest giving us a call at 1-888-272-0220. One of our gift concierge team members are always here to help! 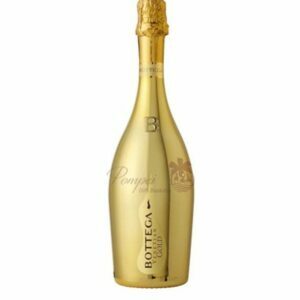 Price includes taxes & standard delivery.